Arkansas Natural Heritage Commission botanist (and ANPS Past President) Brent Baker’s trip to ANHC’s Cove Creek Natural Area northwest of Greenbrier in Faulkner County—the first walkabout of the new season!—drew a very respectable turnout of 13 ANPS members: Martha Bowden (Webmaster), Don Crank (Past President), Donna and Bruno Hanke, Becky Hardin and Butch Hinton, Jay Justice (longtime president of the Arkansas Mycological Society), Pat and Sandy Morris, Eric (President Elect) and Milanne Sundell, and Sid (Treasurer) and Jeanette Vogelpohl. The grand prize of the mile and a half trail loop was to be a look—a first look for many of us—at the Ozark spring beauty growing in ledges and crevices of the sandstone bluffs high above Cove Creek. The plants are not only rare, occurring in just a few known populations in Arkansas, Missouri, and Oklahoma, but their status as a species distinct from Carolina spring beauty was only recently appreciated: Claytonia ozarkensis was described as new to science in 2006. Theo Witsell featured Ozark spring beauty in the Fall 2007 Claytonia, which you can revisit at the ANPS website to see a couple of beautiful and informative photographs of plants in flower. In that article, Theo describes the Eureka Moment when he figured out the astonishing mechanism by which the plants disperse their seeds to sites where they have the best chance to thrive free from the competition of larger species. In Jeanette Vogelpohl’s accompanying photo, this adaptation is nicely illustrated: several of the swelling seed capsules, at the tips of elongating stalks, can be seen ‘hunting’ for a dark crevice in which to open and release their contents, the seeds for the next generation of cliff-dwelling Ozark spring beauties. Our walk at Cove Creek brought to mind a southern European plant unrelated to spring beauty that has evolved a similar dispersal mechanism for a similar habitat: Kenilworth-ivy, Cymbalaria muralis (the species epithet means “of walls” or “growing on walls”), is a beautiful, fascinating, and, yes, alien weed that occurs wild in Arkansas (to my knowledge) in only one place, Eureka Springs, where it is locally abundant and easily observed clambering over garden walls, rock piles, and even at sidewalk and parking lot borders. There the exquisitely adaptive dispersal mechanism can be examined without the fear of losing your life by toppling over a sandstone bluff. The adaptation is captured in a time-lapse motion picture segment in David Attenborough’s BBC production, “The Private Life of Plants,” Volume 1, on how plants do their traveling. The Cove Creek loop trail harbored two additional rare plants. Draba aprica, a whitlow-grass of the mustard family, (and one of the most easily overlooked species of flowering plants in the world), is rated G3/S2 (globally vulnerable). If the lovely dandelion can be ignored and even despised because it’s so common, then perhaps ‘open-ground whitlow-grass’ can attract some appreciation for its rarity. The other rare plant was wild white clover, Trifolium carolinianum, a native species superficially similar to but entirely distinct from the abundant lawn and roadside alien, white clover, T. repens. The alien is a stoloniferous perennial, rooting at the nodes; the native is variously described both as annual and perennial, but either way non-stoloniferous. 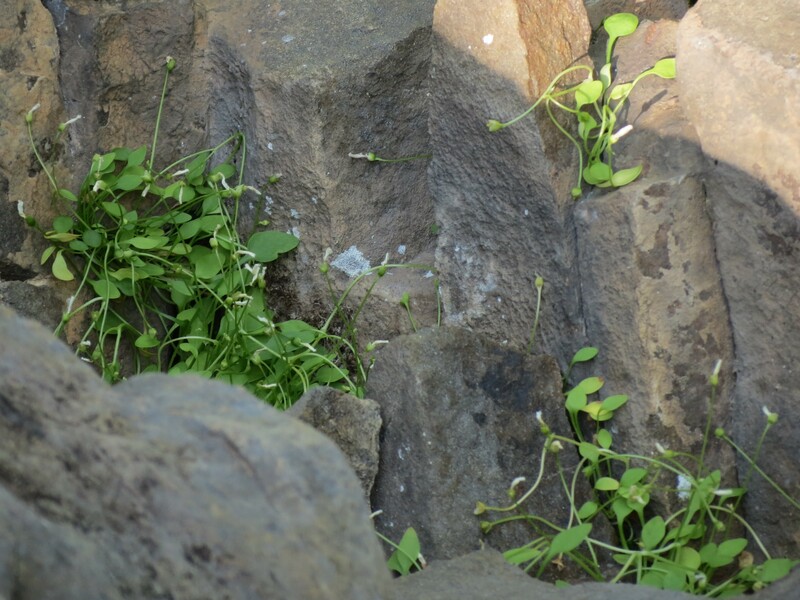 Theo featured wild white or Carolina clover in his article on Arkansas’ native clovers back in the Fall 2009 Claytonia. He observes that the species, which at that time he had seen in the wild only once, in the past had been common: “Nearly all of the known collections are historical, with most made between the 1880s and 1940s, and very few made since the 1950s.” The widespread decline of the native clover, which occurs throughout the Southeast, is a mystery, especially as it thrives on disturbance. Brent Baker pointed out a small population under our feet in the middle of the walking trail and another at the edge of the parking area. We were too early for flowers, but we put our trust in Brent’s keen field eye and added Trifolium carolinianum to our life lists. 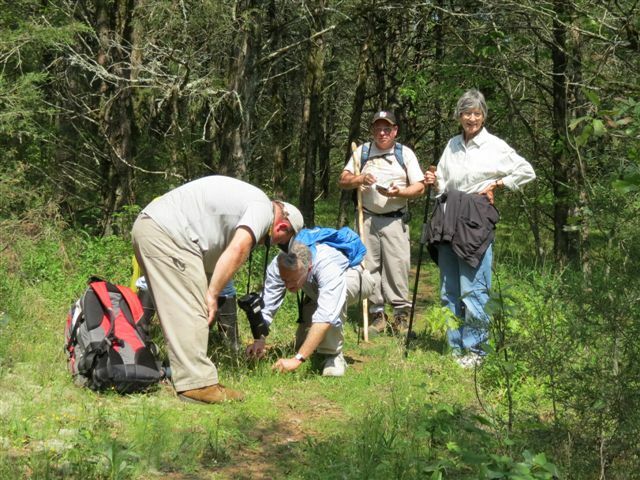 Arkansas’ premier mycologist, Jay Justice, noticed the black cup fungus Urnula along the path. My former dendrology students used to call them black roses. Our timing was perfect. Several of us knew how to tickle the cups with a finger to unleash the cloud of spores, but Jay taught us the alternative technique of simply blowing softly across the top of the cups. After the split second delay, a puff of smoke rose into the air. Very cool! We saw some wildlife: a box turtle & a cottonmouth. But we were out for flowers. And if you’re out for flowers in Arkansas in late March and early April, it’s hard not to have a rewarding walk. We were met by the usual delightful surprises of spring, for example, red buckeye, flowering dogwood, fringe-tree, cross-vine, wild hyacinth, Ohio spiderwort, and fire-pink. For especially photogenic blue, there was blue-eyed-Mary, and bird’s foot violet blooming near the cedars in patches of reindeer moss. Blueberries were everywhere: Vaccinium virgatum (we’re pretty sure it wasn’t V. pallidum) was common, with closed, urn-shaped corollas, and V. stamineum, deerberry, with open, campanulate corollas, was uncommon. Both promised that the future would be sweet. But yellow may have been the dominant theme of the day. Two species of golden ragwort appeared and reappeared, Senecio tomentosus and S. plattensis, both classified now in the genus Packera, but still pretty. Three buttercups with large, medium, and small flowers (also called grande, venti, and tall in the technical literature) accompanied us most of the way: Ranunculus fascicularis, R. harveyi, and R. abortivus. And yellow star-grass was beaming. What a fine trip! For more information on Cove Creek Natural Area and other natural areas in Arkansas, visit the Arkansas Natural Heritage Commission website. Our Join page has information on how you can become a member of the Arkansas Native Plant Society. This entry was posted in Field Trips, Native Plants, Wildflowers and tagged Arkansas Natural Heritage Commission, Brent Baker, Claytonia, Claytonia ozarkensis, Cove Creek (Arkansas) Natural Area, Ozark Spring beauty, Portulacaceae. Bookmark the permalink.